Shut Up by Anne Tibbets. Audience/Genre : Young Adult/Contemporary, Family Drama. Publication : February 28th 2012 by Premier Digital Publishing. I'm kind of a fussy reader. I can usually relate only to certain writing styles (preferably from a first person's point of view) and a lot of times, I've found myself not being able to engross mysel in a novel because the writing doesn't appeal to me. To make things worse, I've been going through a reading slump and the past two weeks, I haven't been reading as much as I usually do. However, once I started reading Shut Up, I was relieved. For a book that seemed so short at first, Shut Up really managed to get the point across. It's one of the rare books that can pull you in and make you feel a whole range of emotions in just a few pages. It was exactly what I needed to wake me up from my slump. Mary's our protagonist: a girl who gets picked on at school and bullied at home. She has an evil witch for a sister and utterly careless parents. Paul, Mary's brother, constantly tells her to shut up through all the crap that gets handed to her but she can't take it anymore and obviously, stuff hits the fan in their household. Repeatedly. Her life is basically hell and not surprisingly, she tries to run away from home..and that pretty much leads to chaos. It's amazing how Anne managed to create such a strong and story character in just around 100 pages. I'm not sure if I should applaud this book for its intensity or judge it for drama but it's honestly remarkable. Mary and Paul had my complete and total sympathy, I was silently fuming on their behalf throughout the novel. Shut Up may be small but regardless of it's size, it's a highly deep and compelling story that will definitely take you on an emotional roller-coaster. Prize is an autographed copy of the book and a bookmark. It's the author/publisher's responsibility to ensure that the winner gets the book, I'm in no way accountable. 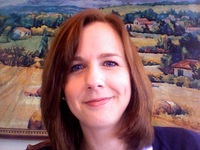 Anne Tibbets is an SCBWI award-winning and Smashwords.com Best Selling author. Anne found her way to young adult fantasy by following what she loves: strong female characters, magic, sword fights and ferocious and cuddly animals. Anne is co-author of the middle grade time travel adventure, "The Amulet Chronicles," author of the young adult fantasy "The Beast Call," and YA contemporary "Shut Up." She divides her time between writing, her family, and three furry creatures that she secretly believes are plotting her assassination. Strictness is not necessary in order to main balance as it can tip the scales too far. I do enjoy these YA Saves type of books, but I do need something light once in a while, too. I do like books that explore deep issues. I don't think a completely stritch upbringing is needed but rather a balance of methods. I can relate to this because I got knocked up at 17 and I have a younger sister too so this might add perspective to that situation. I love emotional books esp when I'm tripping, it helps break down my barriers and makes it easier for me to deal with my personal demons better. I really don't know because I don't have kids but I think there should be rules and boundaries and consequences. I don't think being strict leads to a happy family - understanding does. I do like books that address serious issues. I think that's really what books are for. As for strict parenting, that's up to the individual. All parents do what they think is right. Sometimes one approach works sometimes another, sometimes nothing works. I think talking to your children and listening to them at a time of their choosing is the most important thing about raising children, not a strict upbringing. I do like stories that deal with emotional issues because I can relate to them. I think an open relationship with your kids is important. I like strong emotional reads. I think that there needs to be a balance between strictness and flexibility to maintain the balance in the family..pick your battles. I like emotional reads. I think strictness is necessary in the younger years, but not so much with teens. By then we know better, so we do better. If a YA is still not right by then, there's not much a parent can do about it, because they're practically grown. I like to read a few books that address deep/emotional issues, so long as the parent's aren't abusive. I think there need to be a balance between too strict and not strict at all. If you're too strict your kids will resent you after awhile, but if you have no strictness and let your kids do whatever they will think there are no consequences in life. I like books that address emotional issues because these issues do exist and are verry real. I love books that explore deep emotional issues--isn't that why we read, to feel something? I think, like most of the other commenters, that there should be a balance between strictness and permissiveness. tɦіs ѕіte, it incluԀᥱѕ imροгtаnt Ⅰnfοгmаtіⲟn.